Seek Thermal has reduced a thermal IR camera into a handheld format, so you can see and measure hot spots and cold leaks. The Seek Reveal handheld thermal camera fits comfortably in the hand (4.8 x 2.4 x 1.3 inches), with a rugged design including a rubberized casing. It has a small but quite functional 2 1/4 inch display with a 36 degree field of view. You can use the Reveal to identify hidden hot spots and cold drafts, including energy loss from leaks and drafts, clogs and leaks in pipes, and moisture in walls. Or use it outside to find hidden animals. It also provides temperature measurements at the bottom of the display. The 240 x 320 display is fed from a 206 x 156 thermal sensor, which detects energy from -40 to 626 degrees Fahrenheit at distances up to 500 feet. You also can change the colorization of the thermal display to highlight differences or reduce to black and white. Beyond providing a live display for inspecting a site, the Reveal also is a camera. You can grab images and save them to a microSD card, as well as transferring files over USB. It also includes a bonus 300-lumen LED light with high- and low-intensity settings, so you can see in the dark with IR, or do it the traditional way with your own eyes. The rechargeable battery runs around 11 hours. 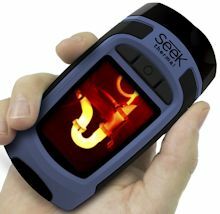 Seek has done an amazing job with the Reveal, packing a functional thermal camera into a convenient and rugged package. It's now available for $399. Entries posted to Manifest Tech Blog in November 2015, listed from oldest to newest.